Earthworms. They're so small and seemingly insignificant that we hardly give them a second thought. Even though they can evoke a squeamish response, earthworms are good for the garden. They burrow and create long tunnels through the soil, which helps aerate and loosen it, creates channels for movement of water and oxygen, and allows plant roots to penetrate more easily. They help mix plant matter into the topsoil where beneficial microorganisms can decompose it. They consume organic matter such as fallen leaves, thereby recycling plant nutrients and increasing soil fertility. Worm castings (a.k.a. poop) are an excellent soil amendment since they're rich in nutrients such as nitrogen, phosphorus, and potassium. Research even suggests that plants have improved disease resistance if planted in soil enriched with worm castings. Worms also provide a valuable source of food for birds, frogs, and other wildlife (not to mention being gobbled up by backyard chickens and fish on hooks). Most of our native local species of worms have been destroyed or displaced by human activity; the kinds we usually see are descendants of hardier worms intentionally or accidentally introduced to North America by early European and Asian immigrants. There are now about 180 different species of earthworms in the U.S. and Canada, a third of which are non-native (including night crawlers). The typical garden earthworms are NOT the same as redworms or “red wigglers” (Eisenia foetida), the non-native species most commonly recommended for use in home worm composting. Earthworms are primitive but fascinating creatures. They don't have eyes, but they do have special light-detecting receptors. Light is a bad thing for creatures whose natural habitat is underground, and worms have evolved to move away from light sources, hence their burrowing instinct. They “hear” by detecting vibrations, and they produce mucus or “slime” in reaction to stress (e.g. being yanked from the ground). They also have voracious appetites: some species can eat their weight in organic matter every day. Worms are hermaphroditic: each worm has both male and female reproductive organs in its elongated, muscular, tube-like body. Typically, two earthworms join side-by-side in opposing directions to mate, and each member of the pair produces an egg capsule from which one to several immature worms eventually emerge. Redworms are among the most prolific breeders. In part due to its reproductive success, some Native American cultures revere the earthworm totem as a symbol of fertility, productive thought, and acceptance of emotions. In our modern society, the worm can represent either the beneficent (as in the sweet, bespectacled bookworm) or malicious (as in harmful software that lurks in the Internet). This is a good time to discredit a common misconception about worms. If a worm is cut in half by a shovel or by an over-enthusiastic tug from a curious child, the two parts won't heal and live to create new worms. The head end (with its tiny brain and five hearts) can't survive without the tail end (with its digestive system), and the worm simply dies. 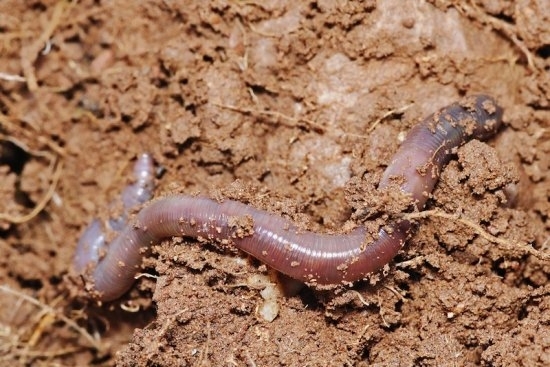 You can use several techniques to encourage greater earthworm populations in your garden: (1) Avoid frequent tilling or cultivation of soil; (2) Minimize the use of synthetic fertilizers and pesticides, all of which disturb naturally occurring soil micro- and macro-organisms; (3) Allow leaf litter to remain on soil year-round, to provide a food source for worms; and (4) “Sheet mulch” bare soil, using layers of cardboard, mulch, and compost to keep soil cool and moist and to provide a source of organic material for worms to eat. A word of caution: don't dump unused live bait worms in a remote natural area. Many forest and mountain environments are naturally devoid of earthworms, and introducing them to those areas can be harmful. Forests often depend on a dense, protective, year-round layer of leaf litter, and earthworms will rapidly consume that thick organic mat. For more about earthworms in our ecosystem, go online to ucanr.edu and search for the article Earthworm Ecology in California, or read the book “The Earth Moved: On the Remarkable Achievements of Earthworms” by Amy Stewart. For advice on gardening related questions, call the UC Master Gardener office at 209-953-6112, or use our website: http://sjmastergardeners.ucanr.edu/CONTACT_US/. I use red wigglers for my worm composting bin (which was easy to construct out of Rubbermaid storage bins--google directions), and am amazed at the amount of kitchen scraps that they can consume! They are fascinating creatures, and an easy "pet" to maintain.